The idea behind the GRAPHIK bowls came from our interest in the gold screen-printing on ceramics. The technique of screen-printing allow to apply a regular and controlled pattern on a three dimension object, providing a productive solution for the series. The principle is very close from decalcomania: The pattern is printed on a transparent medium, which, once dipped in the water, becomes soft enable to fit any shape. 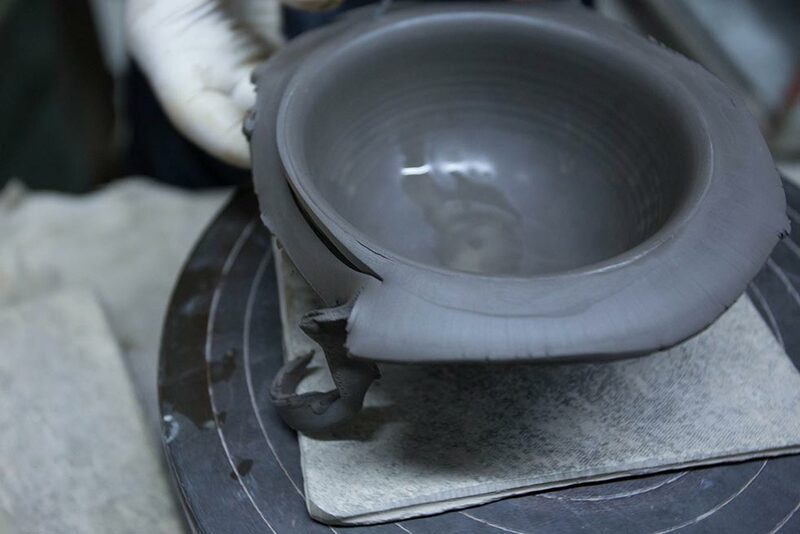 Once the pattern is stick by hand on the ceramic, the pottery is fired a third time; the transparent medium then consume itself letting the ink melt in the glaze and revealing a precise and permanent pattern. For the Graphik bowls we used exactly the same technique, except that instead of printing inks we printed liquid gold. We also decided to explore the technique though another perspective than just applying a decorative pattern on the object. As we used such a beautiful raw material why not using it for itself? It’s how the idea came of printing flat color instead of drawings. We already knew that we wanted to design little bowls, for their basic functionality and simple design. 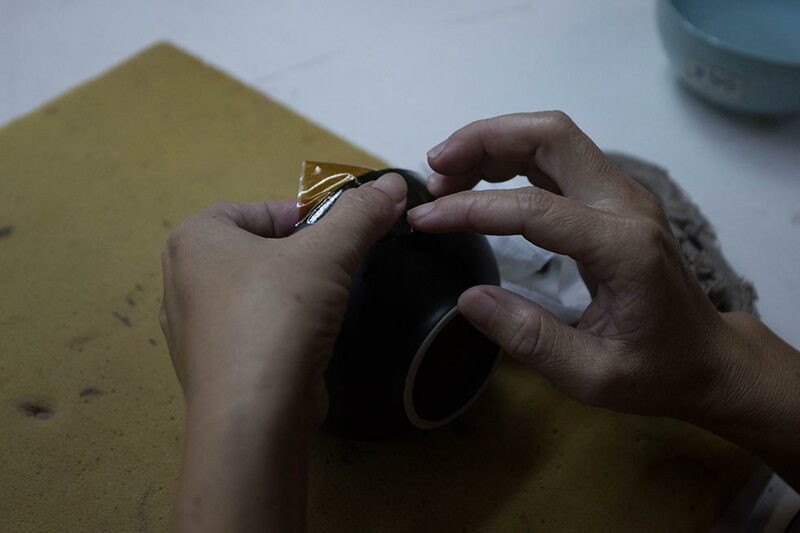 So we played the contrast and we chose to work with squares folded on the edge of the bowl, creating a gold triangle completely melted in the matte glazed ceramic. As you can guess the sheet of gold is very fragile and can be torn at each step of the process. We work a long time with the incredibly gifted handcrafters of Prempacha’s manufactories to find a proper technique to lower the lost and by the same time ease the heart and hands of the workers. The GRAPHIK bowls are the first ceramic pieces of NAAdesign and the beginning of a beautiful collaboration with Prempacha’s manufacturers. Sign up to our Newsletter to hear about new product releases, learn about our design process, and all NAAdesign events.